The Body Glove Performer 11 Blue Ocean Edition iSUP is a jack-of-all-trades. 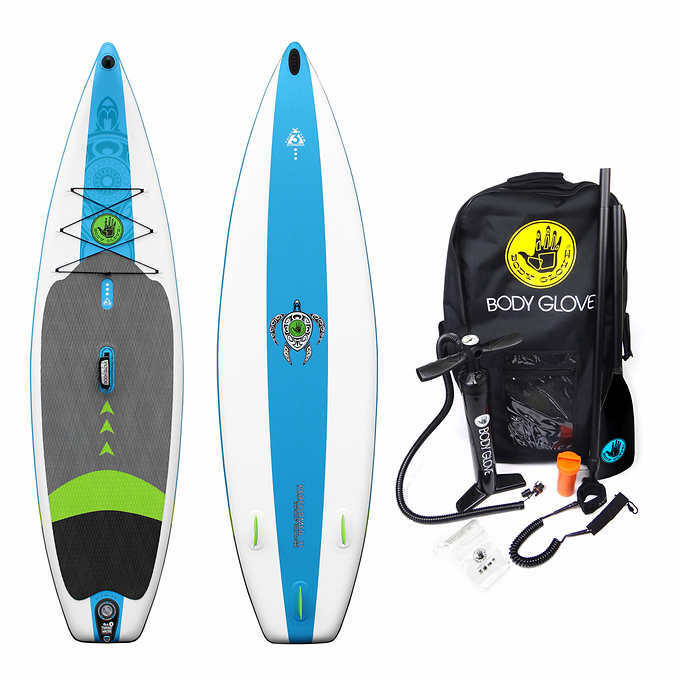 Coming in as a complete kit at $949.00, Body Glove has released a high-level iSUP at a terrific price. The Performer 11 is built for flat water and light river paddling. Designed by Body Glove’s mad scientist athlete/designer Luke Hopkins, the Performer covers a lot of ground in terms of performance, style and added features. 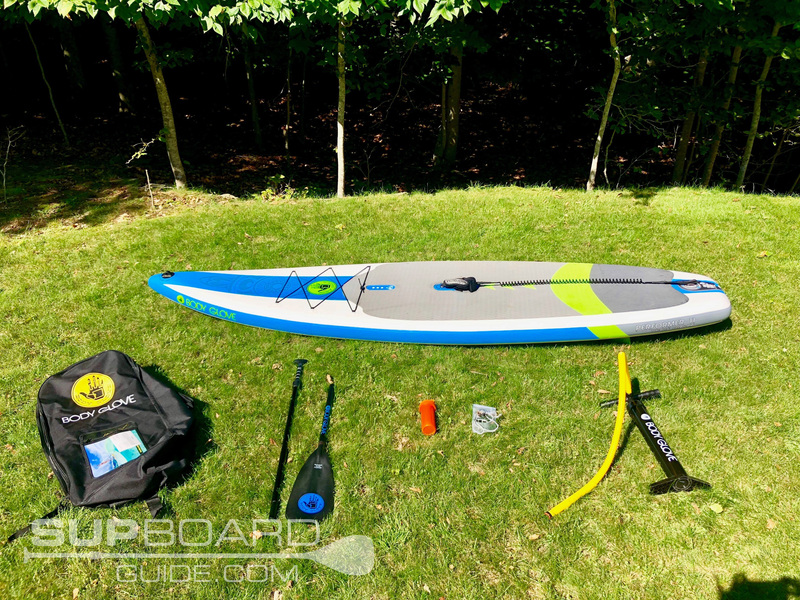 Built to be used a variety of conditions, the Performer is a great all-around touring board to use on lakes or bays as well as an inflatable that offers some performance on the rivers. When I unpacked the bag, the first thing I was impressed with was the durable quality of the iSUP with its poly-vinyl fabric. 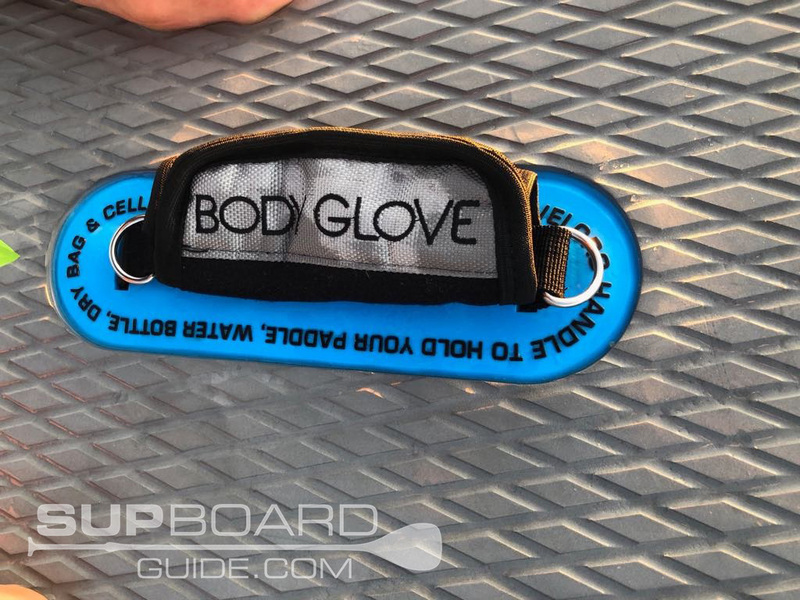 Having seen how many inflatable paddleboards there are on the market that use a cheaper material and can easily be punctured, I appreciated how Body Glove’s commitment to durability through the use of a heavy-duty fabric. Once unpacked, I was surprised by how quickly the Performer 11 inflated. Don’t get me wrong, it’s still a workout; but, with Body Glove’s signature high-pressure pump, even I got the whole thing inflated in 5 minutes. Easy to attach hose and directions, had me working the pressure pump quickly and easily. Even as the board approached maximum density, I found the pump action to be fluid and smooth. 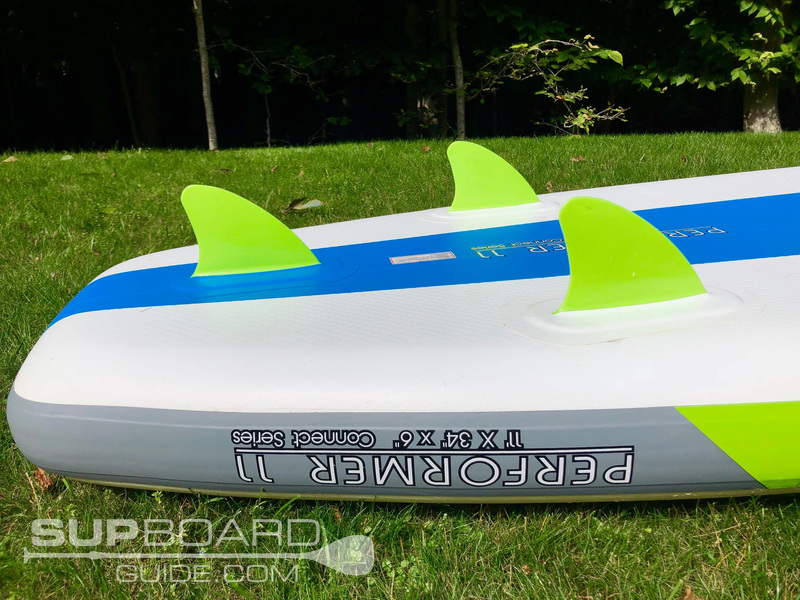 A huge feature for me with iSUPs is the convenience of inflation and the Performer’s quick release and pump make this a board that you don’t have to hassle with to get on or off the water. Bonus! At maximum density (about 15PSI), this board has a solid rigidity and translates to performance on the water. With a triple-layer stringer and that heavy duty poly-vinyl fabric, the Performer 11 is both durable and tough. 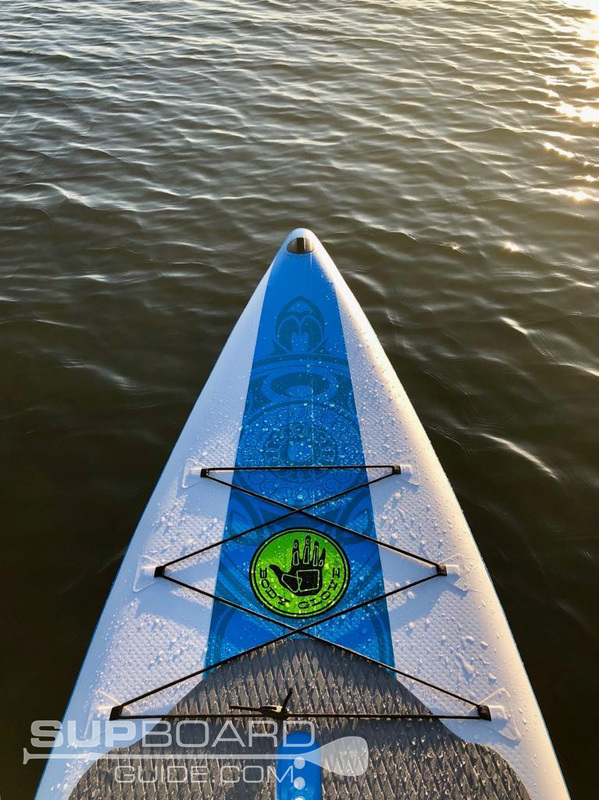 The diamond cut deck padding offers good traction under the feet and spans a good portion of the deck for moving your feet around, especially on those river runs. I especially appreciated the reinforced double layer rails and its underside nose bumper of the Performer to protect the iSUP if run aground, into rocks on the river or into the dock with the kids. A tough, durable ride, this board is built for adventure. With 6 lash down points for webbing and carting gear on long paddles or overnights, the Performer 11 has a lot of thought put into the details. In addition to the ability to carry a full load up front (or a couple of the kiddies) and still find stability, Luke Hopkins also designed the center carrying handle with a velcro closure and 2 D-rings attached to will holster your water bottle or – get this – can be used with your paddle for easy carrying of the board. Now, that’s fabulous. One of my fav features on the Performer 11 were the three fixed-in rubber fins. Small, so the board can navigate the shallows easily and able to flex if run aground for extra longevity. Bonus: the 3 fins come with three little inflatable floaties protecting them, which can be doubled as a decent beer cozy for the flats! When I put this board to the test, I was impressed by its maneuverability and tracking. Somewhat of a board snob, I loved the Performer 11’s pulled in nose, which gave it some lift and speed, even when tracking upwind. That nose, also slightly lifted, gives the board the ability to solidly punch through chop and catch some glide on a downwind run. The overall shape of the board, from pulled in nose to wide middle (34”/86 cm) and a solid block tail makes this one stable iSUP. At 24 lbs, it is easy to carry and transport especially with that carryall handle using your paddle! The Body Glove Performer 11′ kit comes in their signature series backpack. This full sized, front clip, travel-ready, bag fits deflated board, high-pressure pump and 3-piece aluminum paddle. The wide straps make it easy to hoist your load and the extra pockets inside are useful for storage of your car keys, cell phone, small towel and other ancillary items. The quality of the backpack is fair to moderate. The fabric is somewhat thin and one gets the feeling that if you forced that zipper, it might eventually come off. But, if you keep it in a clean, dry place and rinse if it gets any salt on the zipper, it will last you for years to come. Hmmmmmm, the paddle. 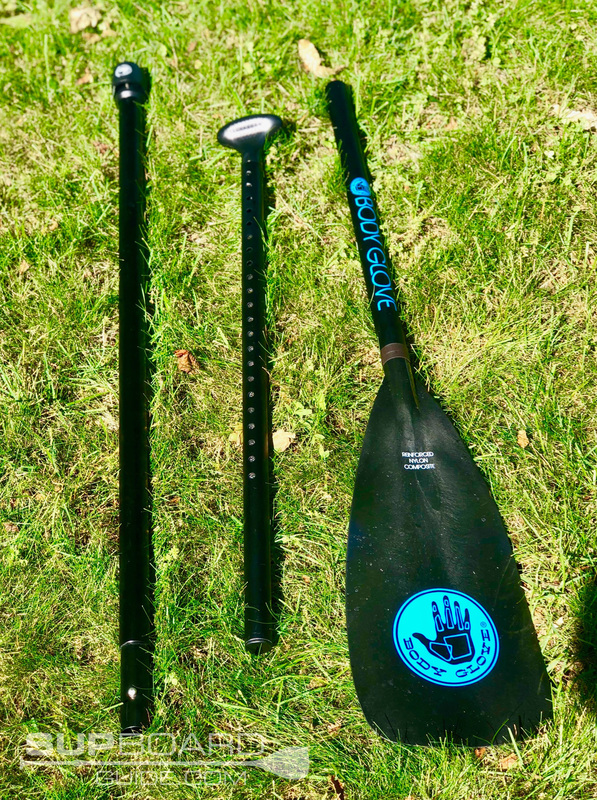 The 3-piece paddle is convenient for breaking down into a smaller size for easy travel. It unclips with ease and slides together well. The paddle also has an easy marking system for finding your measured height and paddle length. However, the paddle shaft is made of aluminum and is heavy. Top heavy in my estimation. The blade itself is made out of reinforced nylon composite; therefore, the shaft has more helft to it than the blade. This is an awkward balance in my opinion, and I wasn’t too fond of it. In addition, the locking system for the top part of the handle left a little wiggle in it, so when I drove the paddle into the water, there was an instability to that top part of the paddle that I didn’t like. Heavy and unstable. Not my favorite part of the mix. But, it is an easy travel paddle and light on storage space, so that’s a plus. If you’re planning on doing some real adventuring or longer paddles on the Performer 11, I suggest you find a better blade to serve you there. Perhaps the Werner adjustable Flow travel paddle. High-pressure pump: Super lightweight and easy to use. I’m not much of a directions-reader and was still able to pop this thing together 1-2-3. Hose attachment is easy and clips in nicely. Pressure gauge is easy to read. As for the pumping action, it was relatively easy and fast. It took about 5-6 minutes to inflate the whole board, and it was a full body work out. I say the pumping was relatively easy because any time you inflate an iSUP, it’s a workout. On a scale of 1 to 10 (ten being the hardest), I gave this a 6 which is pretty darn good! Grateful, as ever, for the dry case for my cell phone (why don’t they make these things with floaties, I wonder?) and the repair kit, although I felt from the toughness of the board, I wouldn’t be needing to make many repairs on this one. 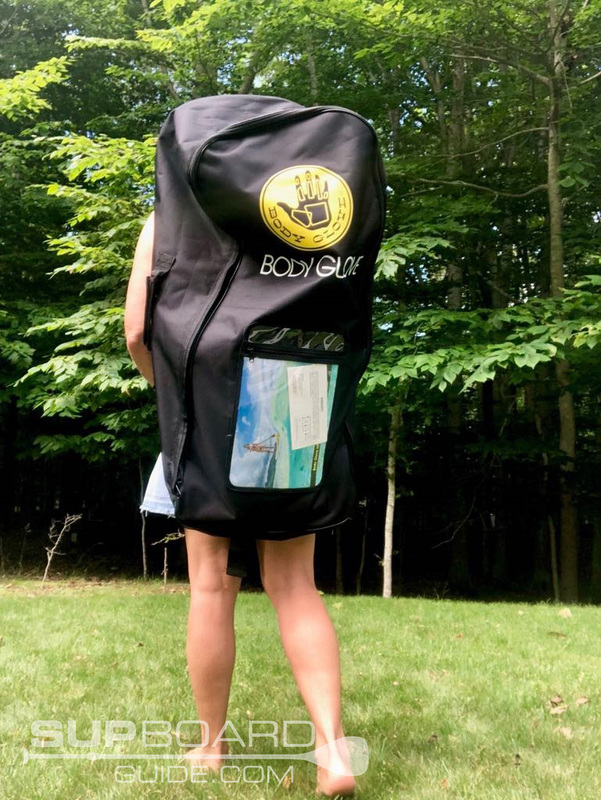 Thanks, Body Glove! The Performer 11 is a solid iSUP for the cost. 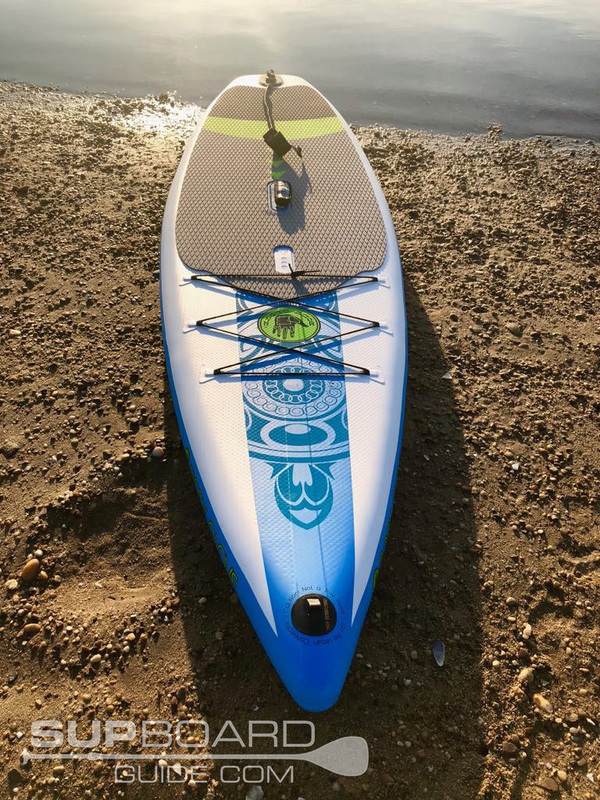 Lightweight and rugged, full of design features for easy travel and a great looking board with those Blue Ocean edition colors that make it look gorgeous on the water. A full-sized travel buddy for adventure at a manageable cost. I’m giving this Body Glove Performer 11 two thumbs up!